At times, the awareness of what it all means escapes us, and at other times, we totally comprehend the meaning yet cannot find the courage to share it. Writers have a responsibility to bring some kind of meaning to events both large and small, happy and sad, and we toil to bring sense out of the senseless. This is where the authentic, sad, and monstrous stuff of life threatens to immobilize the very people who carry the light. We stand with the votive candle in our trembling hands, fearful the rain and wind will extinguish the only light we have. In past times it has. This was before. It was before we realized we had these candles for a reason. We do not need to figure out why we have them. We need to figure out what to DO with them while there is still time. Tonight I will light and relight and keep lighting my small source of light until others find the courage to do the same. At the Vermont Studio Center last summer, I made a tiny and casual observation at the conference table of twenty or so writers who had come to study the craft of candle bearing. During the introductions, each was doing his or her best to present himself as someone who had studied, accomplished, published, and was continuing to do even more. As I listened to each one, I was in awe of the talent, the degrees, and the literary work they were doing on a daily basis. For example, one handsome youth who appeared to be about 17, was actually a college professor who was working to translate Chinese poetry into English. I had nothing to compare. I sat quietly, hoping to be skipped, but one of them said, “What about you? Are you hiding back there?” It was said in jest and with great kindness, but I actually was hiding because I had nothing to say to make myself relevant in such company. Instead I proffered this, “I am Tandy Belt, and I write reality. I am an online blogger. I also write creative non-fiction.” They seemed interested and also surprised. I felt bold enough to continue, “I have been listening to all of you and I must say the credentials are very impressive! I am in awe of each one of you, but I want to say one thing: In the dark of night, when you are alone and afraid you are not quite good enough, smart enough, or talented enough to continue, remember that you are. In your own individual way, in all kinds of areas of effort, you are keeping the light alive. If someone comes by you and blows out your candle, light it again, and again and AGAIN. This is what I do, and will always do, and I will never let my candle go out permanently.” I said it emphatically, because I meant it. I am telling no lie. Every single face around that table registered some combination of relief, agreement, empowerment and appreciation for what I had said, and I was surprised. But simple truth has relevance, and is always immediately recognized. It removes fear and brings goodness out of hiding. It is empowering, even when stated with apprehension. The next day, many came up to me, seeking me out for a private word. I was absolutely stunned. One sweet and shy girl said, “We had a gathering last night and talked for hours about what you said yesterday. We all appreciated it so much!” Then she embraced me, and kissed me on the cheek! Seriously? I learned something important right then and there. It is not the published work, the PhD, or the high paying position at a prestigious school that brings security, because we are all afraid. We all need encouragement. We are all lonely, wounded, doubtful of our own worthiness to continue. It is this pervasive fear that drives us to write, to light those candles, to hope. Tonight I am struggling to light a candle whose wick is wet. My matches are damp. My hands shake. Even here in the darkness, I cannot stop struggling to find a way to get it done. AGAIN. The numbing cold left behind by the massacre of kindergarteners in Newtown, Connecticut threatens to keep me in darkness once and for all. Rain pelts my face, and has the sting of icy fingers around my throat. I have nothing to say, I plead. Let me hide my failure. Let me give up my hope. But my own words come back to haunt me so I keep struggling against the odds. How can I think of even one thing to say?! My candle is extinguished. Yet I remember I am a light carrier, and people are waiting. A feminine voice taunts from a faraway corner. “And what about YOU? Are you HIDING back there?” THE VOICE IS MY OWN. I strike the match one last time, and there is a small flame. I hold it to the wick until my fingers get hot. It fires and sputters, but the light has come. The flame transfers to the candle and I drop the match with great relief. 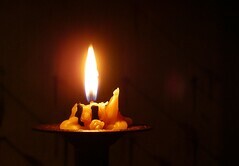 I hold my candle carefully as the comforting light expands so I can see those who are suffering all around me. I am not alone. I was never alone. I hold it up and the faces, though twisted with grief, turn to the sudden light. There is an instant awareness not one of us was ever truly alone, despite our perceptions moments before. The light reveals gaps in the crowd. We have missing. The small spaces between some parents…the tall spots among families with children. We have 28 gaps all told. We all see the gaps and say nothing. What is most painful about being a light carrier is having to recognize both good and evil. We must accept and acknowledge that both are true and exist simultaneously. The simple truth I must share now is this: It is in our own individual power to change the balance of it. In addition, we are powerless to make that change for anyone else. Someone blew my candle out, but I have managed to light it once more. I will do this again. This is my decision, even if I were the only one left who was able to do so. I encourage you to do the same. I have been reluctant to broadcast my personal relationship to God, because I do not consider myself a very good example of what a Christian should look and act like. Still, at the very heart of my writing God’s guidance is evident. Each thing I produce has to past the sniff test of truth, as I understand it before I can expect anyone else to listen! “Frog” is kind of code among Christian believers. It is an acronym for Fully Rely On God. In a confusing array of choices, I take comfort in the guidance of a higher being, one who sees and knows everything. To know He has a plan, and I am part of it, and not all of it, helps me find security in my reason for existing. I write from that source. Often I think about my host of friends who choose not to believe in divine authority. As God is my witness, I do not look down on them because of this. I consider them very dear friends, and accept them just as they are, and they do me. But to drop my pride and reveal I am a “Christian” will cost me something. To affiliate with those who boldly fly the banner of Christ may cause finger-pointing by those who consider themselves better Christians…I will never be able to withstand their withering glares, and whispers of unacceptance, and the judgement and rejection. But to step out and fully rely on God demands I do so publicly. I have been flamed, brow beaten, disrespected and rejected at times when I timidly shared my faith with someone who was skeptical. It is a rare atheist who will politely tolerate a Christian’s viewpoint without openly reviling it. These bullying events have scared me, and although I remained resolute, I became very cautious. I became covert, which only served to make me look odd to believers and unbelievers alike! I do not attend church. I deliberately work on Sundays because nobody else wants to. I enjoy sitting quietly at my desk, thinking my own thoughts, praying, working on things I was too busy to work on during the past week. This day of preparation for the following week is an important service to every one of my co-workers. I like to think of it as a “sacrifice” I make on behalf of others, to enable them to attend services, be with their families, and so on. It is pure joy, and I think God accepts it as my Sabbath, or day of rest. I am deeply embarrassed by “Bible thumpers” and strident Christians who proclaim their own righteousness by disparaging others. They list their own credentials, and their list of good deeds like a well rehearsed speech on why they qualify to carry the name “Christian”. When I study God’s Word, I never find where Christ himself ever did this. It was the Pharisees who acted in such indignant self-righteousness that Jesus rebuked them openly. No other group received such a severe tongue lashing as this group! Of course they were angry, and ultimately silenced Jesus by arranging his death. I think the rest of the story is well-known. The idea of a human being rising from the dead is a hard thing to convince really happened. The idea Jesus was a God/Man is even more difficult! These basic tenets of Christianity are based on faith, not reason. Each human being is perfectly well-known by God, yet we regard God as a fantasy because of our lack of knowledge about Him. Our unbelief, though reasonable, does not change the truth of God one bit. We are free, absolutely free in our choice to bathe in his light, or flee from it. I relate more closely with the “woman at the well” who went to draw water at an odd time of day, after all the “righteous” women had finished. This woman was well-known as a local prostitute, and had a long history in her small town as one who had made wrong choices and was no longer welcome in polite society. Guess who came to that well at the very same time? It was the unknown Jesus, a carpenter from the area. A casual observer in those days would have been astonished and outraged. No self-respecting Jewish man spoke to any woman in public, much less one of her pedigree. Yet Jesus did. But why? She had no credentials, no authority, no money, nothing of value at all. Despite this, they had a long conversation together, about her history, her past, and her present. It was an honest and surprisingly accurate discourse, and she was quite astonished. But there was no condemnation, despite her record. She was a Samaritan, not even one of the “Chosen People”. She had no idea who Jesus was, but she said, “I know that Messiah, (called Christ) is coming. When he comes, he will explain everything to us.” and Jesus answered, “I who speak to you, am he.” This public harlot was the very first person on the planet Jesus revealed he was actually the Messiah! Openly, and in full view of everyone, she was the first to hear these words. He is a rule breaker, a man without fear, and one who is able to love someone everyone else condemns. I cannot get past a person like Jesus! Neither did she. She ran back to town and began to tell anyone who would listen about this encounter. She recognized the truth, accepted it, and shared it. She could have refused the offer, but did not. Each of us will eventually have the same opportunity and choice. It has nothing to do with our own choices prior to the encounter, but everything to do with whether or not we believe Jesus can find us worth loving just as we are, in all our self judgement, shame, anger, and fear. The acceptance Jesus demonstrated to such a woman leaves me assured any other person, including me, can be loved and accepted also! In the coming weeks, I am going to discuss the importance of women in Jesus’ time on earth. It is an amazing and redemptive saga. Does not take a lot of room for “just the two of us”! This is a snapshot of our sleeping space. In this quiet spot each of us feels safe, secure, warm and cared for, whether we are together or alone. From my side of the bed, I compose drafts, have my devotional time, or “warm up” for the day by being served breakfast in bed. Who knew a cowboy could cook so well, and be so willing? From his side of the bed he rests, sleeps, passes the time, or heals from his decades as a roughneck, farrier, cowboy, laborer…on the premise he is “giving me space and quiet” while I write. I sleep on a rather regular 11PM to 7AM schedule and he is on a roughly 8PM-4AM sleeping schedule. In this way, we have togetherness with apartness, something we enjoy. There is freedom for us as individuals when nobody is mandating bed time or rising time. Each of us needs serenity and quiet, and we must allow space for it in our homes. The outside world gets chaotic, and we need safety and peace when we are tired. This is my space for resting when my shoulders droop, and I feel heavy in my heart. Casting about for a worthwhile blog topic, I clicked around online, reading many great pieces of solitary thought, and stories about historical and inspiring characters, and many other things…but I knew I was procrastinating. I had no inspiration of my own, yet I had the itch. I decided to write about character development. When humming along in a story, I do not construct characters. They appear from the mists fully developed and with their own opinions and dialects. My job is to “record what they say and do” which helps my story along in ways I never could have anticipated! “William O. Barrett, sir, please to make your acquaintance,” Billy responded automatically, still staring at the food and ignoring the man’s outstretched hand. Gunny turned his back on the boy and turned toward the fire, pouring a cup of coffee into an enamel cup. “Here you go.” he said, rising and turning, holding the cup out to Billy. Billy took it without saying anything, and took a careful sip, testing the heat of the black liquid before taking a mouthful. The aroma filled him as much as the liquid itself. He blew across the top of it before taking another sip. He leaned against a large granite boulder. Gunny stared hard at him while he drank. The old man’s powers of observation surpassed even his own awareness of them. They had built up naturally over time. His curiosity had a patient quality about it, a self contained and non interfering quality. In the same way that Billy had assessed the red mare, Gunny now assessed his visitor, sensing more than knowing that something was amiss. He checked the fish, and turned it over in the pan, saying nothing. This truly surprised Gunny. His preliminary assessment of the kid did not include the power of observation as a probable skill. Gunny did not respond. It wasn’t out of rudeness, but was simply due to the fact that he did not know for sure what was wrong. In the world of horsemen silence is preferred to openly stated ignorance. The ultimate way to display ignorance is to pretend you know more than you do. Gunny is a favorite character of mine, even though Billy is the real protagonist in my novel. I believe I may write another where Gunny plays a featured role. He is an amazingly generous person who helps to save Billy’s life and later dies at Billy’s hands when the situation is reversed. I would love to develop a novel about Gunny’s life and times. I like to use dialogue for character development, allowing each character to speak for himself. Gunny is a man of very few words, but even his reticence relays much about his character. It was somewhat frustrating to me as a writer to record Gunny’s contribution to the story. I had to allow him time to show me, through his body language what kind of person he was. I had to see deeply into him, and respond to the very few words he spoke to Billy. I had no idea who he was when I first encountered him. But as he revealed himself to me, I would laugh at his jokes, marvel at his kindness, and grieve for his losses. I cannot fully understand how he “came to be” but to me, he is a very real human being.